It sounds like I’m the only one in the universe who didn’t care for Di Fiore Marquet. Yelp has rave reviews, as does New York. What am I missing? Perhaps the dishes we ordered weren’t their specialty. Then again, shouldn’t the chef be able to competently cook any menu item? I think so. In the mood for eggs, I decided I wanted an omelette with avocado and cheddar cheese. Seems like a reasonable request for brunch, right? Well, the omelette was fine until I discovered, on its underside, that it was runny and barely cooked. In the past month or so, I’ve tried to open my mind to runny-egg dishes, such as Eggs Benedict and Eggs Florentine. I’m still in the early stages of accepting these foods, so seeing runny eggs in my omelette positively disgusted me. 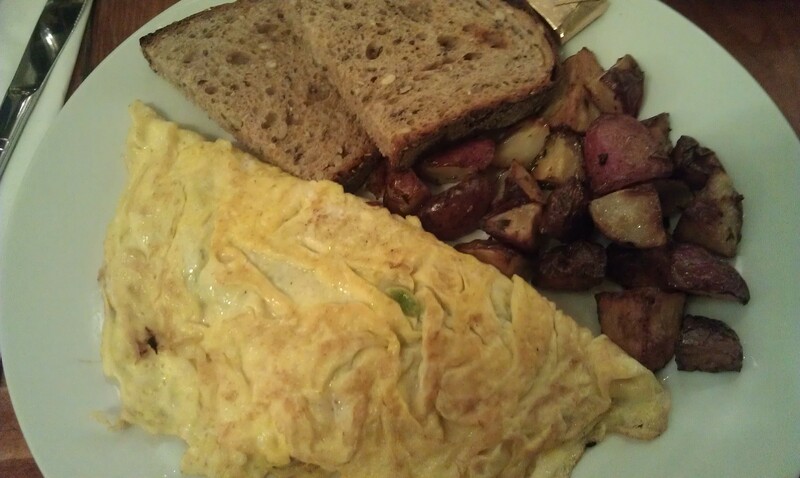 The omelette was accompanied by some toast and roasted potatoes, which were hard and not exactly flavorful. My dining partner ordered corn pancakes. He’s always trying the new (or weird) things on menus, something that I admire (especially since he always lets me taste his exotic food). 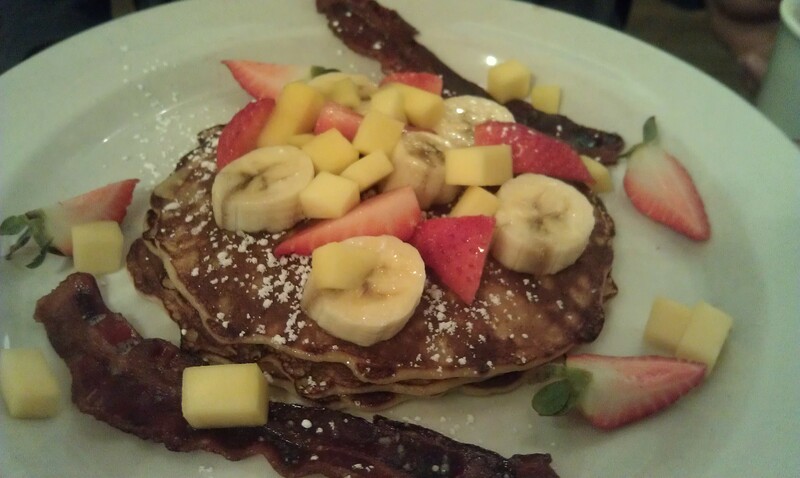 Chopped fruit adorned the corn pancakes, a nice touch. When asked what the corn pancakes tasted like, MDP replied, “They tasted like corn.” There you have it. I ordered a cappuccino, which was delicious and perfectly made. But it took about 10 minutes to get my coffee drink. In other words, the service is slow. I wouldn’t recommend this place if you are in a hurry to catch the big sales at Filene’s Basement. If you’re in Union Square, you might want to try a different place for brunch. I hear Max Brenner has an outstanding menu. Or, if you’re daring, you could even walk up to the Shake Shack and have a late brunch/lunch instead. In other words, there is a multitude of brunch places for you to try in Manhattan. You might skip Di Fiore Marquet, in that case. Take the 4/5/6 or N/R/Q to Union Square.